The Russian TV hosts are the celebrated, popular personalities in which the audience is interested not least, than politicians, show business stars. For many, they become role models regarding wardrobe style, way of dressing, or even about the behavior evaluation of certain events. Therefore, TV hosts of Russia always feel responsibility of the work, they try to meet the high requirements completely. The most striking and charming representatives of television, of course, are the women TV presenters. Each of them causes admiration of attractive appearance, education, elegant wardrobe and behavior. Many of TV hosts already have admirers who watch life, work, new progress of the idols. Not only in appearance differ the Russian TV hosts, each of them is also an outstanding, extraordinary personality. On the way to successful career of the leader it is necessary to get good professional education, wide experience of work on television. It is important to create a bright and individual image which will be able to draw attention of the audience and by that will attract also interest in those transfers, the program of news and to other teleproducts in which TV hosts of Russia participate. The trust of the audience, their emotional perception of transfer will become result of professional work. For most of the people the television became an integral part of life, it gives important and useful information, can offer the most various entertainments for any age. And people who work at television and appear every day on the screen, these are already family members. The most famous and popular TV hosts of the woman, thanks to the charm, beauty, grant every day joy, pleasant emotions. Each morning transfer with participation of this or that TV host, becomes the best beginning of a day, grants a charge of good mood. Nice and beautiful faces of leaders can be seen now and not only on TV, they perfectly conduct various concerts, a show, auctions, charitable actions. I present to you the Top-34 most beautiful Russian presenters as information and analytical and entertainment programs of Russian television. You can also see the ranking of the Most Beautiful Presenters in the World. 34. Ekaterina Mcituridze (10 January 1972) - Russian TV presenter, film critic and film historian. 33. Salima Zarif (7 March 1984) - Russian TV presenter. 32. Tatjana Gevorkjan (20 April 1974) - Russian TV presenter, journalist, actress. 31. Viktoriya Ushkevich (27 January 1989) - model and journalist. 30. Julia Bordovskih (5 July 1969) - TV host. 29. Alisa Yarovskaya (07 December 1980) - TV anchor. 28. Alena Gorenko (7 May 1981) - Russian TV host and actress. 27. Julia Alekseenko (21 September 1988) - actress, TV host and reporter. 26. Mariya Morgun (20 September 1984) - Russian TV journalist. 25. Mariya Gorban (26 December, 1986) - Russian actress and TV presenter. 24. Yekaterina Andreyeva (27 November 1961) - Russian journalist, actress. 23. Larisa Verbitskaya (30 November 1959) - Russian TV presenter, Honored Artist of Russia. 22. Victoria Shirokova (17 November) - TV host of sports news. 21. Kseniya Borodina (8 March 1983) - TV host of reality show "Dom-2" on TNT. 20. Tatyana Arno (7 November 1981) - Russian TV presenter. 19. Anfisa Chehova (21 December 1977) - Russian TV presenter, singer and actress. 18. 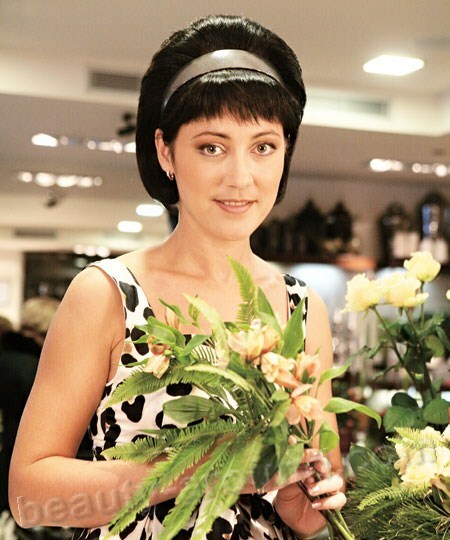 Irena Ponaroshku (14 October 1982) - Russian TV presenter, VJ on TV. 17. Ekaterina Konovalova (28 February 1974) - TV host of the program "Vesti-Sport" on the Russian channel. 16. Irina Polyakova - TV host of weather forecast in the news program on NTV. 15. Margarita Kaistra - TV host of stock exchange news. 14. Evelina Bledans (5 April, 1969) - Soviet and Russian film and stage actress, singer and television presenter. 13. Anastasiya Tregubova (21 September 1983) - TV host of 1 channel. 12. Irina Shadrina (27 February 1985) - Russian TV anchor. 11. Anna Kasterova (21 September 1984) - host of "Vesti. Friday." 10. Mariya Bondareva (1984) - economic news presenter on the channel "Russia 24". 9. Victoria Lopyreva (26 July 1983) - TV presenter and model. 8. Juliya Zimina (4 July 1981) - TV presenter and actress. 7. Elena Vinnik (1976) - TV presenter on channel NTV. 6. Dana Borisova (13 June 1976) - Russian TV presenter. 5. Anastasiya Chernobrovina (10 April 1977) - Russian TV presenter and journalist. 4. Olga Zhuk (20 October 1987) - Russian TV host. 3. Tina Kandelaki (10 November 1975) - Russian journalist, presenter, producer and public figure. 2. Mariya Sittel (9 Nobember 1975) - TV anchor of news program. 1. Oxana Fedorova (17 December 1977) - Russian fashion model, singer and TV anchor, winner Miss Universe 2002.